Placed second to last in “side B” of Collateral, “What Will Become of Us” is a raw, contemplative lullaby that thoroughly exemplifies the complex emotions on display on this album, not only from song to song, but within the songs themselves. Musically and thematically, there really is no precedent for this song in Phillip Phillips’ previous albums. While The World From the Side of the Moon gave us a “A Fool’s Dance,” and Behind The Light gave us “My Boy,” songs inhabiting dark, intense landscapes, neither of these songs feels related to “What Will Become of Us.” However, a couple of unreleased songs, dating as far back as 2013, may provide the link we are missing. That year, Phillip toured almost non-stop, and it was in the spring and then the fall that he debuted two beautiful but deeply melancholic songs in the middle of a couple of shows. The first song, “Creatures,” tells a story that goes from sadness into warm, shining hope. This is the most realized of the two. The second is a still unnamed song that fans quickly nicknamed “Ghostly Man” (after a line in the song), and which, in contrast to “Creatures,” doesn’t offer any real hopeful resolution. Both songs share a similar sense of despair, evoked through rich, descriptive lyrics and haunting melodies. Five years later, these ideas seem to finally come together in perfect balance in “What Will Become of Us,” a song that also tells a story steeped in quiet sorrow through vivid, cinematic images. In this case, however, the emotions are a bit harder to untangle, where the intensity comes from harder to pintpoint; it’s a work of elegant sophistication and subtlety. Anybody familiar with Phillip’s personal struggles during the writing of this record could easy read the lyrics as a mirror for his own life: two people who love each other are in a dire situation they are trying to survive. But anybody who is also familiar with Phillip’s music knows that there is always so much more to his lyrics. Yes, Collateral is a much more transparent album, but the music and the lyrics always resonate beyond the personal—this is what great songs do—and “What Will Become of Us” is a good example of this. The song could work both as fiction– through vivid images where we can easily insert characters–and as personal; where one ends and the other begins is unclear. This is very much a trait of Phillip’s writing. Phillip and Dave debuted “What Will Become of Us” during an acoustic show they did in the spring of 2017. The song, caught in a video by a fan, seemed complete, ready to be released. However, back in the studio, when the time came to record the song, it was an inspiration of the moment to record the song as it was, Phillip and Dave playing it live without any other instruments or production going to be added to it later. This was not planned. What was captured by Ryan Hadlock (the album’s producer) is a performance that is a raw and real as it can be committed on a record. I’ve though often of the word that would help me understand this song. It is not resignation—that would imply the narrator giving up and I don’t think that’s the case. Nor is it acceptance, or fear, though both emotions are there as well. To celebrate and to mourn at once, to be afraid but to jump nonetheless. It’s about grace, about faith, about being at peace with our decisions and our destiny but also about taking full charge and being the agent of those decisions and that destiny. Or maybe it’s simply about telling and showing (intensively, urgently) those you love that you love them before it’s too late. 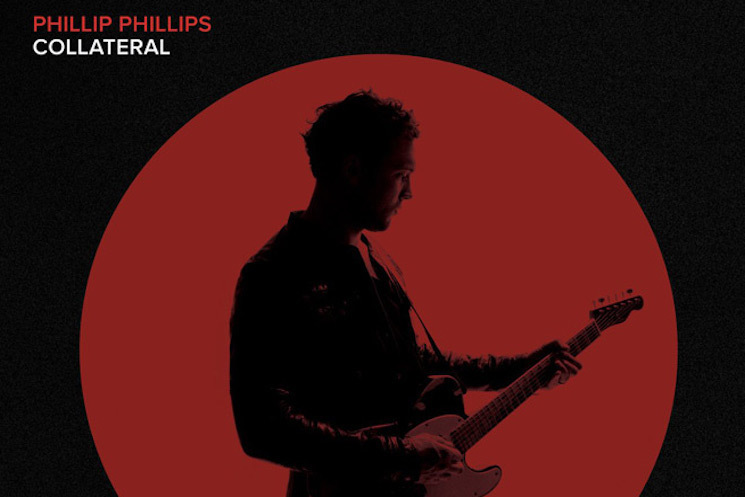 Visit Phillip Phillips’ official site to listen or buy Collateral. And don’t forget to check out our previous Collateral Deep Dives.